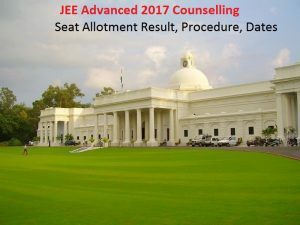 JEE Advanced Counselling 2017 -जी एडवांस्ड काउंसलिंग is going to be held in the last week of June by Joint seat allocation authority also popular as JoSAA. The organisation conducts and manages Counselling and seat allotment procedure for the candidates who have qualified JEE Advanced 2017. The entrance examination is being conducted for the taking admission in various IITs, and ISM Dhanbad. The candidates who are going to appear in the JEE Advanced Counselling Procedure are suggested to check JEE Advanced Counselling Eligibility Criteria. We are providing you with the detailed information about JEE Advanced Counselling Schedule 2017. It is hard to tell that IITs (Indian Institute of Technology) admissions are considered as The Best Engineering Institution in India which provides quality education along with practical knowledge. The alumni of IITs are now at very good positions all across the world. We would strictly advise to our users who find themselves eligible, appear in the counselling process. JEE Advanced 2017 is an entrance examination conducted for the admission in various IITs and ISM Dhanbad. To get eligible to appear in this entrance examination applicant has to first qualify JEE Main 2017. The applicants can check the JEE Advanced Counselling Eligibility Criteria below. For both the entrance examinations are been conducted by JoSAA Counselling. The qualified candidates of JEE Advanced 2017 are suggested to check all the details related to JEE Advanced Counselling Process 2017. JEE Advanced Counselling is been done under JoSAA Counselling 2017. In JEE Advanced counselling Process, the applicant has to first select the choice of the institute and then LOCK the choices. At this time no registration fee is required to be paid. The applicants will later report to the temporary seat allotted institution and will verify his or her academic and personal documents. Finally, he or she get a confirmed seat in one of the IITs or ISM Dhanbad. The applicant needs to visit the official website first. Login with correct credentials same as you have provided at the time of JEE Main 2017. Now choose the option from the available choices and not forget to LOCK them. The applicant must have qualified JEE Main 2017 & JEE Advanced 2017 with minimum cut off marks. The applicant must have qualified XII Class with minimum percentages as per decided by JoSAA. IIT JEE Advanced 2017 Seat Allotment List will be released in the second week of July. The applicants will be able to check IIT- JEE Advanced Counselling 2017 Seat Matrix on the official website. we will also update the same when it would officially announce on the online portal of JoSAA Counselling 2017 in the middle of July.